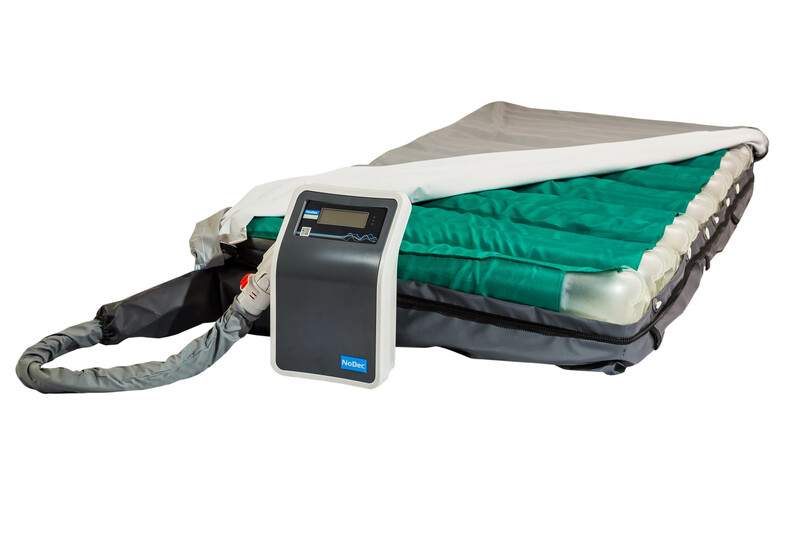 The WIZARD® is an innovative mattress that offers protection to bedridden and critically ill immobile patients. It combines Rober’s signature alternating pressure cell design with an impressive tilt facility. This action gently turns the patient onto their side, comfortably and correctly, thus reducing the requirement for manual handling. Pressure ulcers result from prolonged pressure on bony prominences such as the heels, spine, buttocks and hips. As critically ill patients are unable to turn themselves, caregivers are required to reposition them in bed. If this is not done correctly, even this action can cause friction and shearing – again leading to the development of pressure ulcers. Research shows that patients admitted to intensive care units (ICU) are the most at risk of developing pressure ulcers. This high risk starts from the first day of their hospital stay. Critically ill patients are often confined to their bed for long periods, either sedated or receiving mechanical ventilation. The technology used in the WIZARD mimics the body’s natural movements to prevent pressure ulcers from forming. Moving up and down in a wave-like motion, it provides regular and complete pressure relief to all potential contact points. The dynamic system also offers therapeutic properties to promote the healing of established ulcers. The mattress is easy to use and operate and has been designed with patient and carer safety in mind. It also includes a range of additional nursing support and includes patient safety measures, such as integrated sides and an in-built Cardio Pulmonary Resuscitation (CPR) valve to provide quick deflation in the case of an emergency. Pressure ulcers are a rising problem around the world and in the UK alone, they affect over 700,000 people a year and add an additional £4,000 per ulcer onto each person’s care bill. They are also linked to prolonged hospitalisation, pain, social isolation and in worst cases, death. Arab Health will take place from 29 January - 1 February 2018 at the Dubai International Convention & Exhibition Centre. Throughout the show, Rober will be located on the UK Pavilion Hall 6, Stand G70.